(+2 in the eaves) with enclosed garden. Dogs welcome. Perfect location as very close to the beach, green, harbour and Bell Inn. 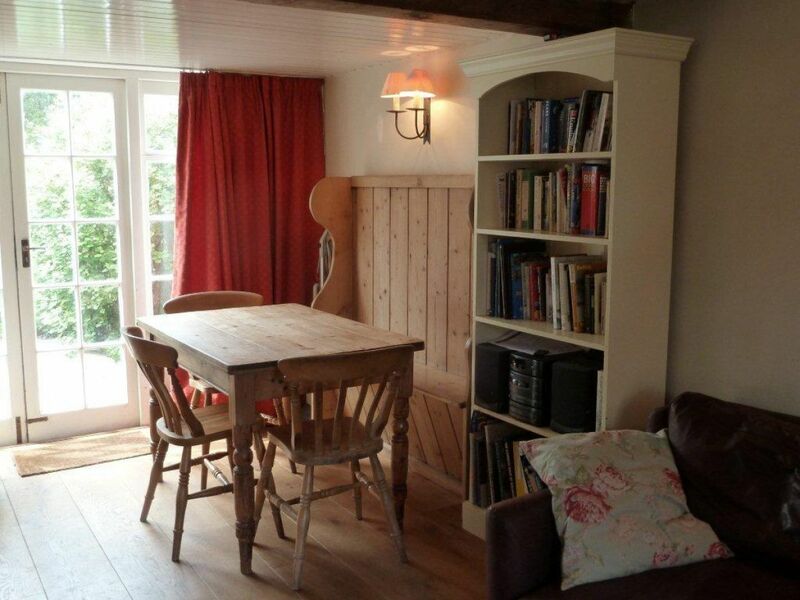 View pictures of Halfpenny Cottage. The cottage (which sleeps 4 + 2). is ideally located in the heart of the village of Walberswick, close to the beach, river Blyth, 15th Century Bell Inn and Walberswick village green. It is about 200 years old with lots of character and has a completely enclosed rear garden. Dogs are welcome. The cottage has free wi-fi. 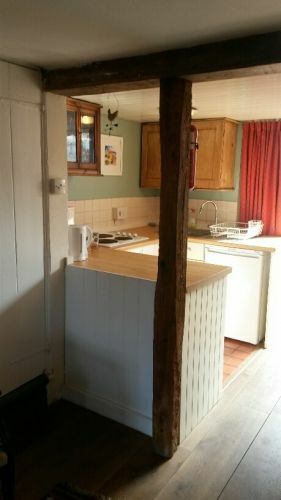 The downstairs is one open plan room, with a kitchen, dining and sitting room area and an inglenook, wood-burner feature and beams. There is a closable door at the foot of the stairs and French doors at the back that lead out onto the enclosed patio and long garden. 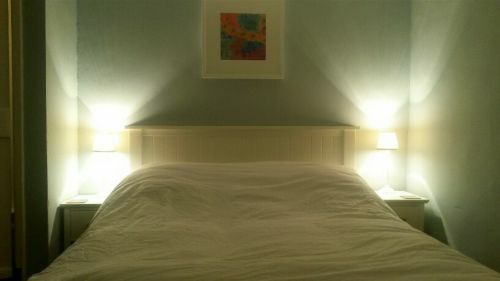 The first floor has two refurbished cosy double bedrooms, with wide beamed oak floors, and a white bathroom, with bath. There is a second floor occasional attic room with 2 single beds under the eaves, lots of chilrens' toys and books, limited standing and sea views. There is also a cupboard for extra hanging space. There is an electric oven, microwave, fridge with small freezer compartment, CD player/ radio, T.V., DVD player and overnight storage heaters. One or two well behaved dogs are welcome. An enclosed winding staircase, which may not be suitable for everyone. Tariff includes bedlinen, heating and electricity. Saturday to Saturday lets only. Any other dates not displayed are already booked. Halfpenny Cottage in Walberswick, full of character, with enclosed garden and in the perfect location. 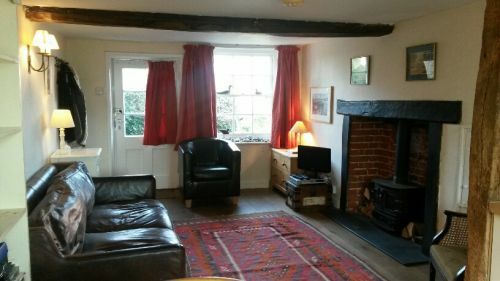 Sitting room area with inglenook, beams, wood-burner feature, TV, DVD player, CD player and board games. You can view a total of 10 images of Halfpenny Cottage by tapping an above image and scrolling through the gallery. 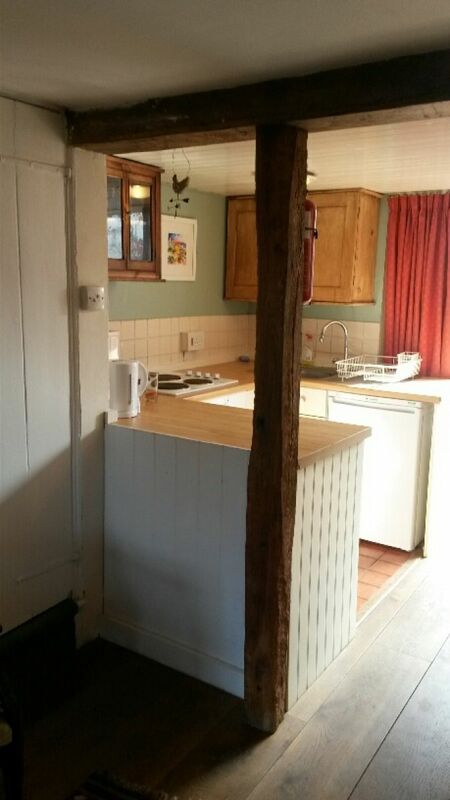 Kitchen area, with a nice mixture of antique wall cupboards, plus beams.